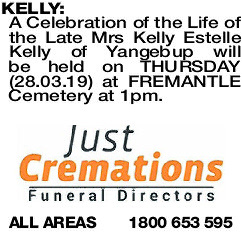 A Celebration of the Life of the Late Mrs Kelly Estelle Kelly of Yangebup will be held on THURSDAY (28.03.19) at FREMANTLE Cemetery at 1pm. KELLY KELLY ESTELLE With a broken heart we say goodbye. You tried so hard, you did your best. 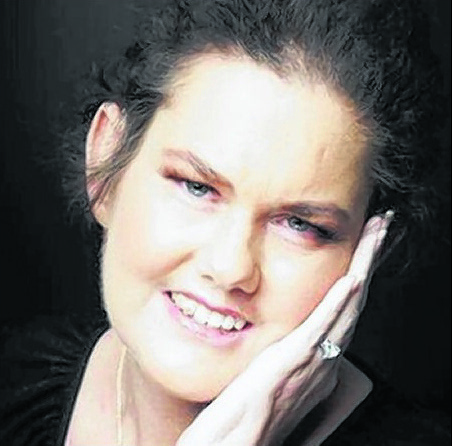 suffering, now is time for you to rest our dear daughter Kelly. KELLY KELLY ESTELLE Kelly, you have been taken far too soon. Aunty Kathleen, Leanne, Justin, Chace, Kade, Anthony, Mia, Olivia and Marko.